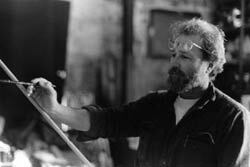 Born in 1944, Virgil Elliott was fortunate enough to have been the first son of Dollye McAlister Elliott, a schoolteacher and amateur artist, who began his art education in the second year of his life. The first lesson kindled a lifelong burning obsession with art, and his talents developed rapidly with constant practice drawing, and, later, painting. The excellent instruction of illustrators Robert Fawcett, Albert Dorne, Austin Briggs, Steven Dohanos, Harold Von Schmidt and others, via correspondence course, helped him tremendously,and by his late teens, he was an accomplished draftsman and competent oil painter. As a soldier in the U.S. Army he traveled to Europe in 1963,returning to the United States in 1965. While overseas, he took art classes in the evenings with an instructor whose last name he cannot recall, an American named "Ken," who taught at the USO in Mannheim, Germany, and who helped young PFC Elliott advance his painting skills still further. And of course there were museums full of Old Master paintings throughout Europe to inspire him. Profoundly moved by the works of the Old Masters, particularly Rembrandt and Vermeer, Elliott was dissatisfied with his own abilities, and sought to learn still more. Quickly becoming disillusioned with college-level art instruction at the colleges and universities he attended for several years following his discharge from the Army, due to their emphasis on "modern" styles which did not interest him, he endeavored to teach himself from that point onward. His quest for knowledge drove him to search out old manuscripts to study, and to travel far and wide to view the Old Master paintings wherever they might be found, in addition to constant ongoing practice drawing and painting. Several years as a freelance commercial artist helped to hone his talents, and in 1982 he felt he was ready to begin his career in fine art. He has won many honors, awards and distinctions since his fine arts debut, and has become a sought-after teacher, lecturer, art show judge and writer in addition to the ongoing demand for his talents as a portrait painter and fine artist. In 1985 he was awarded the American Portrait Society's certification, a distinction shared by only 24 artists in the world. As an outspoken member of the Artists' Advisory Panel to the California State Fair in 1987, Elliott spearheaded a successful effort to open the State Fair's art show to representational art, which had been previously excluded from the show, and to depose the officials responsible for its exclusion. He was elected an Associate Guild Member by the American Society of Classical Realism in 1996, and was made a Signature Member of the American Society of Portrait Artists that same year, in addition to winning an award in The Artist's Magazine's portrait competition. His book, Traditional Oil Painting: Advanced Techniques and Concepts from the Renaissance to the Present, a 21-year project, was published in 2007 by Watson-Guptill Publications (now Random House). Virgil Elliott has had articles published in American Artist magazine, The Artist's Magazine, The Portrait Signature, the Chronicle of Higher Education, On the Level and other publications. He is a member of the Advisory Board of the Art Renewal Center, and a member of the American Society for Testing and Materials (ASTM) Subcommittee on Artist's Paints and Materials. Virgil Elliott is listed in Who's Who in the World, Who's Who in America, and the Art Renewal Center's Gallery of Living Masters.